The Dell Glass Company produced hand made decorative and utilitarian glassware in their Millville, New Jersey facility during the 1940's. The sales representative for the company was Claude M. Sperling. Showrooms were located in New York City and Los Angeles. 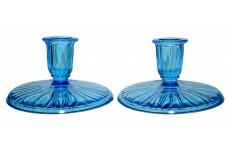 Stylistic ashtrays, candy jars, lamps, decanters and other beverage items were important Dell contributions to the glassware trends of the era. Production of Dell's colored Tulip dinnerware pattern appears to date from the mid to late 1940's. Advertising for this pattern appears in 1945, in leading ladies magazines and in the Montgomery Ward catalogue. Although it is not known exactly what happened to this company, trade journal references and advertisements disappeared by 1950.